I’ve been bent on Made-in-USA for the past several weeks. It’s not that I don’t or won’t buy things made elsewhere, it’s almost impossible not to. But when there is a choice, sometimes it’s simply a matter of paying attention to the labeling and choosing one product over another. Sometimes you will pay more for American made, but not always. Recently I went to a local tool store because I needed a new hose for my shop compressor. We are lucky to still have a couple local, independent tool stores here in Reno, Nevada. Apex Saw Works has been a family owned business since 1968, their prices are competitive, and their service is good. Cracked and leaking old compressor hose. 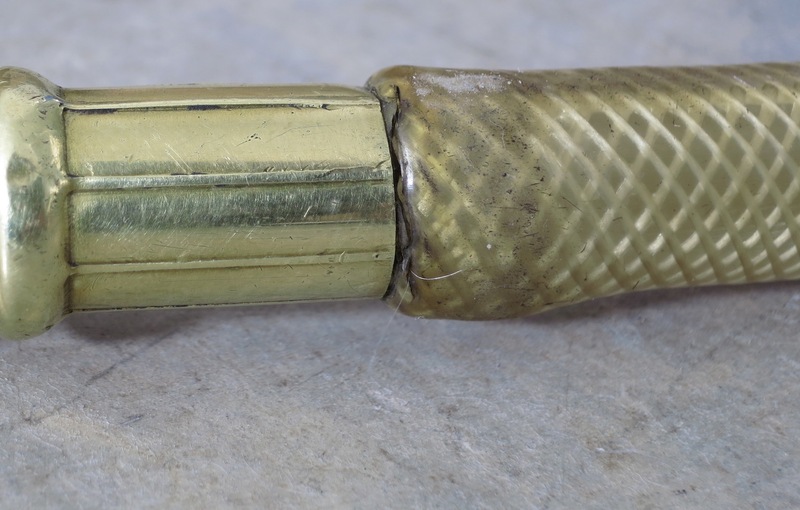 My compressor hose had been failing at the end for years, and finally split and started leaking when bent. 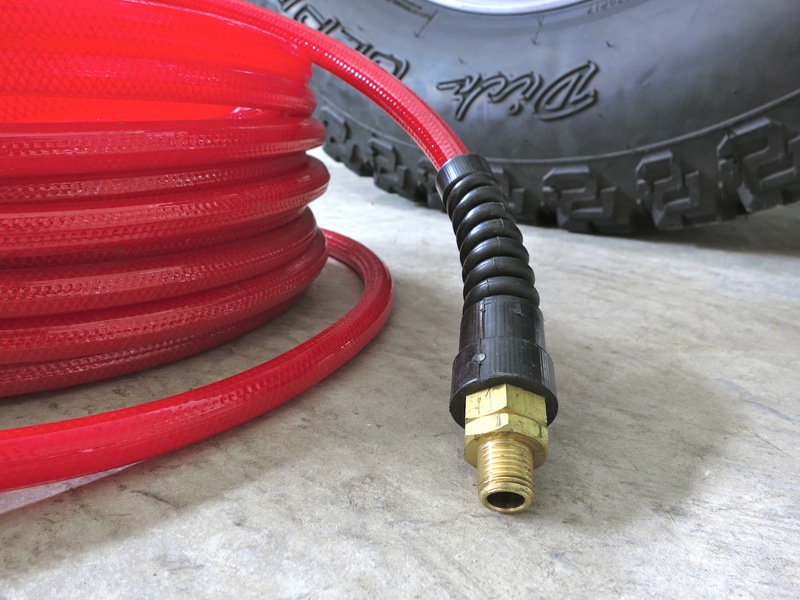 The old 3/8″ hose was Made-in-USA (surprisingly), and at 100-feet long was longer than I need in my garage. My compressor is on wheels and can be moved, but 50-feet is a better length for most projects. There were a few hose options, one much more heavy-duty (and heavy) than I wanted, and probably not needed for my home shop. 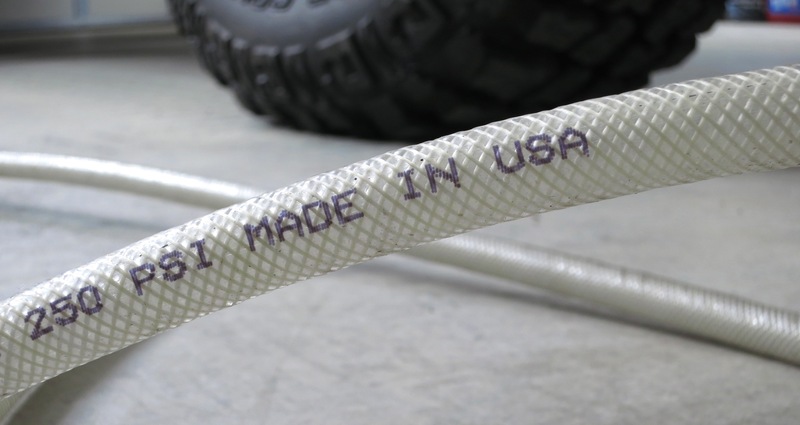 I decided on this 3/8″ x 50′ lightweight, kink & tangle resistant, polyurethane-reinforced AirPro product, marked “Made in the USA” and “Patent Pending”. Made by Contractor’s Choice which is based in Eugene, Oregon. I could have chosen blue, but of course I picked the red line for $37.00. The reinforced end will help prevent cracking. Our climate is dry, though I should still drain the moisture from the bottom of my compressor more often, but I took this opportunity to open the petcock. There was a surprising amount of water inside, though there was very little rust. Reading the instructions on the back of the packaging I was surprised to learn there was a break-in procedure to follow: Uncoil and straighten the hose to full length, attach an air nozzle or tool, charge with air to recommended working pressure, pull straight to remove any twists, and allow to sit under pressure for 30-minutes. The instructions also state to store the hose in loops, not to chain braid or coil into figure eights. Draining moisture from the compressor tank. After two days the tank has lost very little pressure while sitting fully charged, a nice upgrade. Should I swap some tires and wheels?